Hemlock woolly adelgid), or HWA, is member of the Sternorrhyncha suborder of the Order Hemiptera and native to East Asia. It feeds by sucking sap from hemlock and spruce trees (Tsuga spp. ; Picea spp.). 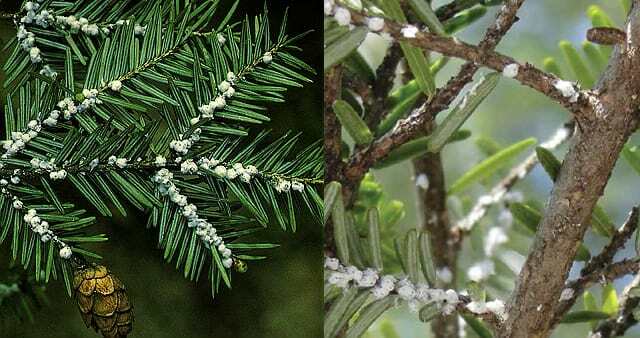 In eastern North America, it is a destructive pest that gravely threatens the eastern hemlock (Tsuga canadensis) and the Carolina hemlock (Tsuga caroliniana).Nymphs soft-bodied and wingless. Mature nymphs, winged. Wingless are visible only with hand-lens. For example hemlock woolly adelgid is often buried within a cottony mass of wax. As a member of the Adelgidae, it shares many characteristics with its relatives, the true aphids (Aphididae) and phylloxerans (Phylloxeridae), such as a complex life cycle with sexual and asexual generations. Adelgids are different from true aphids in that they are oviparous (lay eggs) in all generations and use only certain conifer genera as hosts. The Adelgidae also includes other invasive pests such as the balsam woolly adelgid, A. piceae , on true firs in North America, and the pine adelgids, Pineus pini and P. boerneri , in pine plantations around the World. HWA inserts its long, piercing-sucking mouth parts ( into the base of hemlock needles and feeds on nutrients stored in the xylem ray cells. In addition to removing the tree’s nutrients, the adelgid is thought to cause a hypersensitive response that restricts water transport in the tree. Other stress factors can intensify these effects, causing decline and death of trees of all age classes. HWA can alternate between Tsuga sieboldii and Picea torano in areas where these species coexist. Picea is considered the primary host because that is where sexual reproduction occurs. Tsuga is the secondary host because it supports only asexual generations. There are two asexual generations per year on hemlock with a proportion of the second generation developing into winged migrants, called sexuparae. When sexuparae land on a suitable spruce, they produce a very short generation of sexual females and males. Each mated female lays a single, relatively large egg, which develops into an asexual female (fundatrix) that settles near a bud to overwinter. In the spring, feeding by the fundatrix begins transforming the bud into a gall that will house her offspring. The fundatrix lays a large clutch of eggs. Upon egg hatch, crawlers walk into the developing gall. These individuals, called gallicolae, feed inside the multi-chambered gall causing the completion of gall formation. HWA galls have a characteristically round shape, unique among adelgid species. A single gall can house over 1,000 adelgids. When the winged gallicolae mature, they emerge from the gall as it dries, and fly back to hemlock.